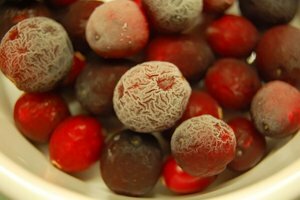 Freeze drying food is a process of preserving food and making it lighter and more convenient for a range of purposes from emergency survival food, to food for astronauts. If you are thinking of going hiking or if you are worried about disaster scenarios, then having some freeze dried food around is a good gambit. And even if you have no interest in preparing for disaster, you probably already eat a fair amount of freeze dried food on your cereal and from other sources. But what precisely is it? Most food contains a lot of moisture. Unless it has previously been freeze dried then it will naturally contain moisture to varying degrees whether it’s a chocolate bar or whether it’s an orange. Of course this moisture adds to the flavor and it makes food nicely thirst quenching in some cases as well as satisfying. However it also has some detrimental effects in that it both makes food heavier (like how much heavier your t-shirt is if it’s wet before you wring it out), and makes it the perfect place for bacteria and mold. Mold and germs love moisture, that’s why you get mold formulating in the moist areas of your home, and why we get fungus under our armpits. This then means that your food has a sell by date which is a rough estimate of how long it will be before the bacteria starts to break it down – even when kept in the fridge. Freeze dried food however is that same food but without the moisture. Of course this affects the taste, but it also means your food won’t go off for a long time and it means that it will be much lighter and easier to transport. If you are going hiking then taken freeze dried food is a great strategy as you can carry it without being weighed down and because you won’t need to refrigerate it. Likewise it’s ideal for keeping in your larder for a rainy day, and it’s perfect for cereal manufacturers if they want to include fruits in their breakfast cereals. So how does the freeze drying process work? Well as the name might have inclined you to believe, the first step is that the food is frozen. This then causes the particles of moisture to become more manageable particles of ice/steam which can more easily be removed from the food substance. Next the food is subjected to a vacuum. This is a situation in which there is low air pressure which then causes the particles in the food to want to spread out and equalize. The basics of pressure mean that particles that are packed into an area will always try to spread out to areas that are less packed – just like water will spread out on a plate. In short then this is the equivalent of holding a vacuum cleaner against the frozen food, which is enough to draw out the moisture. The freeze dried food is then immediately packed in an air tight container which prevents the food from re-absorbing environmental moisture, and adds an extra layer of protection against bacteria.